International Checkers joins Computer-Human debate! With all the intrigue over chess-playing computers, one should know that other board sports have also thrown their hat into the silicon vs. carbon debate. 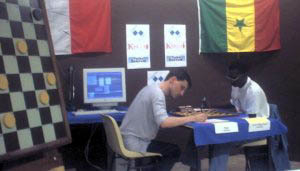 Last August, the world's best draughts computer known as "Buggy" played Grandmaster Ndiaga Samb (pictured right) of Senegal, West Africa. The match was sponsored by Le Damier de l'Opéra, Kolsloot, Turbo Dambase, Crédit Mutuel and was held during the French Draughts National Championship. GM Samb, the world's #12 draughts player won the two-set match 4-2 and 11-9 (including blitz tie-breaker). Perhaps this allowed the human species to breathe a sigh of relief… at least for now. It was the first such competition in the sport of draughts and pre-match predictions were very much divided with 44% predicting victory for GM Samb and 33% for Buggy. What is amazing about draughts is the amazing similarities to chess in notation and in analysis. For example, see this example of an annotated game. Draughts is played on a 10X10 board. 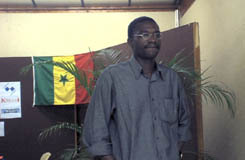 GM Samb leads a strong contingent of Senegalese players who grace the charts of 100 top players in the world. Joining GM Samb (world's #12) is GM Bassirou Ba (#26), IM Gaoussou Sidibe (#34), and GM As Malick El-Hadj Diallo (#56). West African nation Côte d'Ivoire has six players in the top 100: NM Lancine Cherif (#49), FM Houphouet Niamke (#75), IM Ehire Eugene Aman (#79), NM Oscar Lognon (#83), NM Jean Claude Ahon (#89), NM Edmond Beugre (#98). One may believe that producing a strong draughts program is easier than in chess, but the idea that draught pieces have the same movement makes such a feat even more challenging because patterns may be harder to understand or see. In the ancient game of Go, computers are nowhere near reaching elite level due to its intricate nature. Go differs in that you put "stones" on a 19X19 board instead of taking pieces off the board as in chess or draughts. Whereas computers haven't raised to elite levels in board sports like go and draughts, in chess it's a different matter. Computer chess has been around for decades and programs have been faring well against humans in recent competitions (e.g., Shredder demolition of Swiss national Team and Hiarcs 8's 2nd place in Argentina Masters 2002) and have also been used playing partners as in the Kramnik-Anand Advanced Match. In October, GM Vladimir Kramnik will take on Deep Fritz in a highly anticipated match to take place in Bahrain. Stay tuned for more battles!! Read The Chess Drum's, "Is chess king in Africa? No... Africa is home of world's #11 checker player!!"